When you’re looking to add that extra hint of magic to life’s adventures, there are all kinds of hobbies, pastimes and experiences that you could try. I had always talked about giving horse riding a try but it seemed like something that I was never destined to do until I was given a first riding experience as a gift. 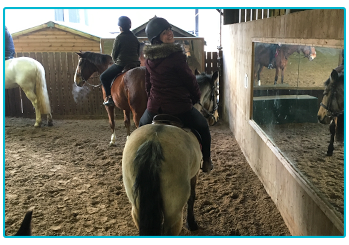 There can be something quite intimidating and even scary about the thought of horse riding but I figured that there must be something that makes it so special and explains why so many people are hooked on all things equestrian! Here at The Insurance Emporium, we believe in trying out new things in life and jumping in with both feet. This the lowdown on a first ever horse riding experience! Friars Hill Riding Stables in Yorkshire was our venue of choice for this first equine escapade. Based in Sinnington, on the edge of the North Yorkshire Moors, the stables have been running for many years and current proprietor Alison Brown took over from her mother around 30 years ago. 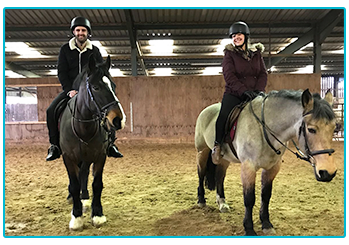 Friars Hill say “the belief that horse riding is only for those better-off has proven to be an out of date description” and we were excited to use this as an opportunity to see what the world of equine had to offer. We were due to take part in a six-person beginner’s session which seemed like a great social way to try out the pastime, or embarrass ourselves in the presence of loved ones! We were kitted out with helmets and boots and asked about our experience and ability, all designed to ensure that we were given a lesson tailored to our needs. 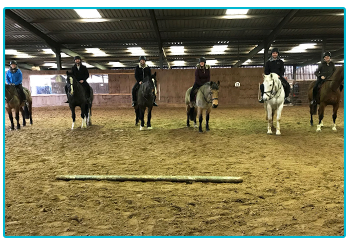 Overall, it was an incredibly warming atmosphere at the stables, which was reassuring for those of us feeling a little bit nervous! Alison was kindly on hand to add some comic relief to proceedings with her great sense of humour as we prepared to mount up! There was also free cake available, there’s nothing quite like free cake to calm the nerves before you clamber onto the back of a rather large animal for the first time! As the lesson started, we were led into a large barn and introduced to our horses. I was paired up with a beautiful 12 year-old Bay Cob-type gelding called Bruce. Standing next to these majestic horses definitely gave me an appreciation of their beauty and made it obvious to see why their owners and riders love them so dearly. After giving him a brief stroke on the nose and a pep-talk, where I tried out my horse whispering skills to convince Bruce not to send me flying like a real life Buckaroo, we mounted our new equine pals. There was definitely something nerve-wracking about doing that for the first time and hoping that Bruce didn’t decide to shed his new cargo. It’s also a strong test of your balance and core strength in order to stay upright! Luckily, we had a fantastic group of instructors in our session who were led by Rachel. Along with her helpers Fiona and Charlotte, they were on hand to ease us in. Charlotte did a fantastic job holding onto Bruce’s lead, giving me a little peace of mind that we wouldn’t be galloping out-of-control into the distance! The pleasant nature of the horses really is testament to the hard work put in and superb bond that the team at the stables have with the equine. At 15.3hh, Bruce truly was a gentle giant (that might not seem overly large to you but it certainly did to me!) We were taken through the initial steps on how to hold the reins and get them moving. With just a soft kick to the side we were off, although I couldn’t help but want to apologise to Bruce for sticking the boot in! Once we’d got going, I was really struck by how relaxing it could be riding and feeling connected to these beautiful animals! Rachel was a fantastic leader, learning all our names in no time and being attentive to the whole group. We went through a range of different activities from simple walking and directing, zig-zagging through obstacles and trotting. The latter became a dreaded and rather uncomfortable task for the men in the group! It’s most likely not as painful for those with good form… we just didn’t have good form! The experience lasted an hour but it absolutely flew by. The whole group felt like we’d learned a lot and I certainly gained a huge appreciation for why people become so hooked on the equine life! I’ll even admit that I felt a little sad saying goodbye to Bruce! I like to think that he felt the same but considering he’s usually an eventing horse, he’s probably had better days at the office! A class such as the one that we took part in can be held on a group, private or shared-private basis at Friars Hill. These lessons range from complete beginners to those who want to improve their already blossoming skills or revisit an old passion. On top of this, the stables also offer hacking and trekking as well as summer riding camps that cater to a variety of different age groups. Friars Hill also run a Riding for the Disabled Group which caters for adults and children. This could work for people who need a little more assistance but don’t feel like they wish to access the Riding for the Disabled Association (RDA). The instructors are all trained and affiliated with the RDA and are experienced in helping riders with disabilities. The stables run an annual show and gymkhana which helps to raise the bulk of the funds to keep this going. From experience, Friars Hill is a very welcoming place for riders of any ability. If you’re looking to set your first foot into the world of horse riding or find a place with a nice atmosphere to continue your riding adventures, Friars Hill Stables could be a great option! For many people, sampling horse riding and finding a way into the world of equine can be a daunting prospect. Locating the right place to try out the pastime for the first time might be difficult but could be very rewarding when you’ve given it a try! If you do find yourself saddling up and developing a passion for horse riding, you may end up needing insurance in case you end up out of the saddle! At The Insurance Emporium, our new Horse Rider policies have a 15% Introductory Discount* and cover up to £22,500 for Personal Accident**. Trot on down to The Insurance Emporium today to find out more! *15% Introductory Discount only applies to brand new policies. **Lunar Monthly Junior and Adult policies. This blog is in no way sponsored, endorsed or administered by Friars Hill Riding Stables.